We planted these beauties this past spring and they are thriving in the garden. 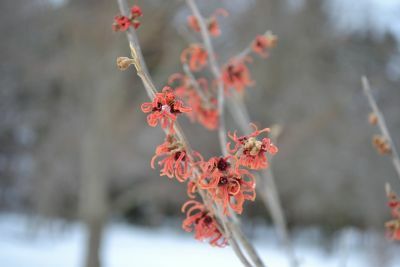 Hamamelis x intermedia hybrids are crosses between Japanese witch hazel (H. japonica) and Chinese witch hazel (H. mollis). They are somewhat coarse, loosely-branched, medium to large, deciduous shrubs that typically grow 12-20’ tall. They are particularly noted for their spidery, often fragrant, mid- to late winter flowers which appear before the spring foliage emerges. The genus name comes from the Greek words hama meaning at same time and melon meaning apple or fruit in reference to the occurrence of both fruit and flowers at the same time on this shrub (particularly in the case of fall flowering members of the genus).